Appreciating your kitchen over the years, both for its aesthetics and for its functionality, is a privilege never lacking to Viem customers, for this reason, every one of our kitchens is designed to fit your individual personality. Modern kitchens, in particular, must complement the rhythms and spaces of our times and add a stylish flare to our homes where dynamics of efficiency and design mingle in perfect balance. 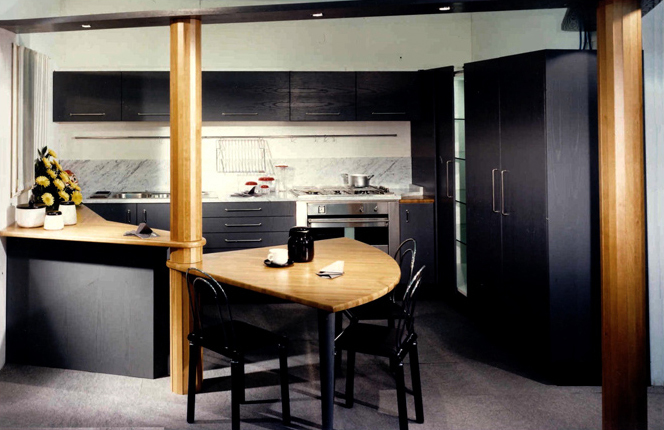 Kitchen with column and hanging grey oak lacquered cabinet, open-pore and horizontal grain. 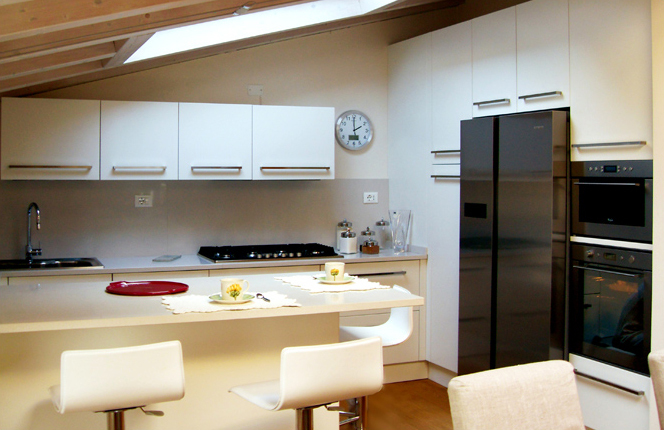 Plasma TV inserted in the column, Samsung stainless steel touch oven and refrigerator with ice maker. Faded oak peninsula and kitchen bases, horizontal grain. Stainless steel countertop with integrated cooker and sink. Flamed Absolute Black granite peninsula countertop with breakfast area in faded oak. 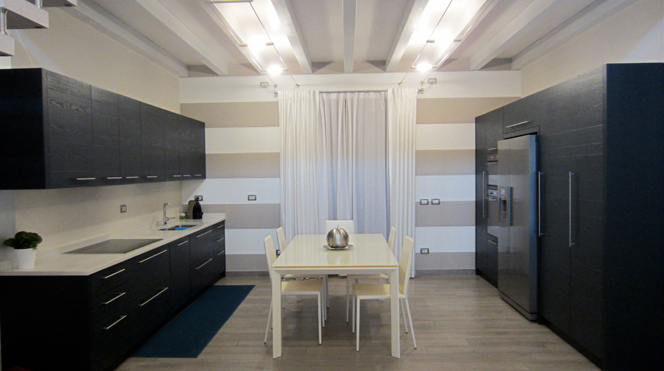 Opaque lacquered kitchen, made with under-beams with columns with a flush sliding door. Large island that includes a work area with a filotop induction cooker and undermounted sink, table area with the same level, extractable chest drawers. 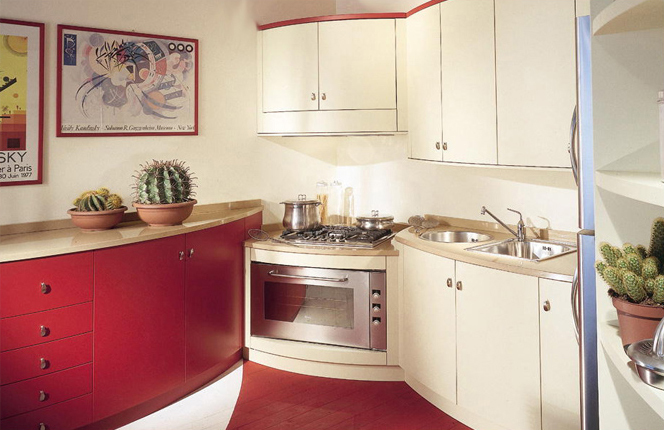 Opaque lacquered kitchen with curved pink and ivory finished hanging cabinets and bases. Recessed cooker with 90 cm stainless steel oven. External stainless steel Whirlpool refrigerator. Countertops in 3 cm okite. 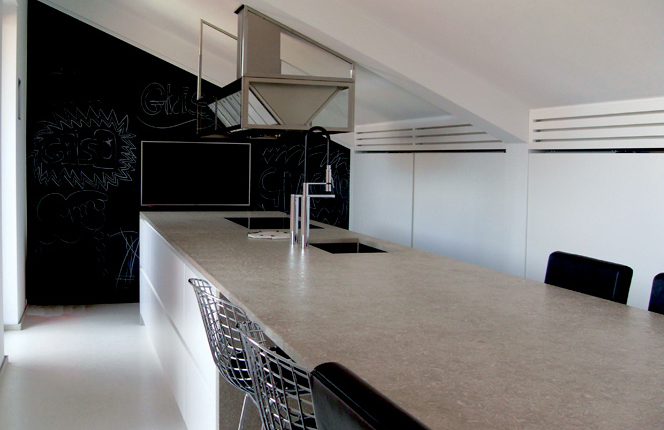 Dark grey lacquered ash kitchen with vertical grain. Inclined peninsula and semi-round table that spins around the pillar. Large shelf with spotlights, corner column with floor lighting and sliding door. 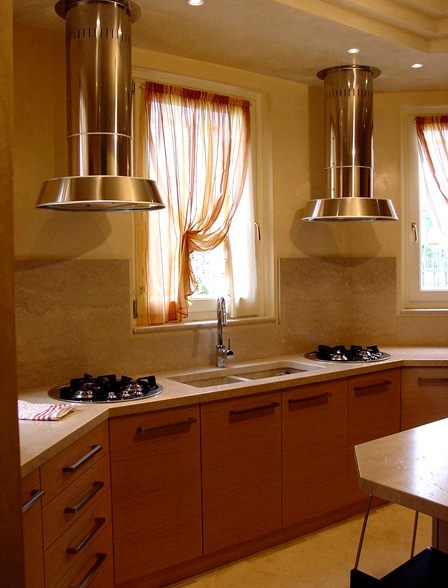 Countertops and backguard in shiny Carrara marble. 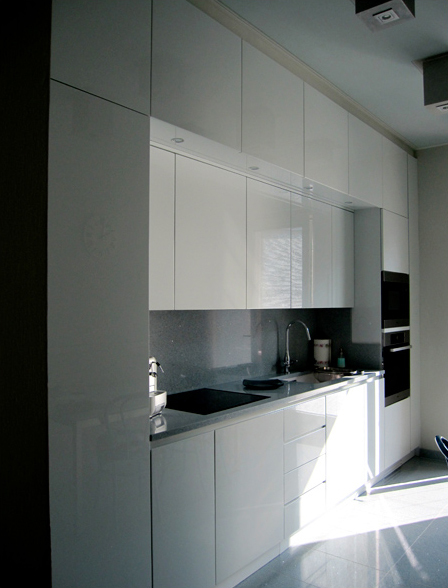 White shiny lacquered kitchen with double hanging cabinets (upper ones 60 cm in depth). Island bench with counter table, central hood with shiny lacquer finishing. Island countertop in white okite and white induction cooker. Black okite countertop and backguard in the sink area. 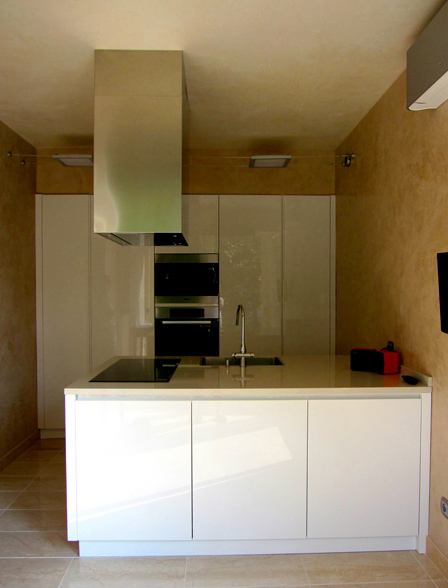 Open-pore brushed lacquered oak kitchen. 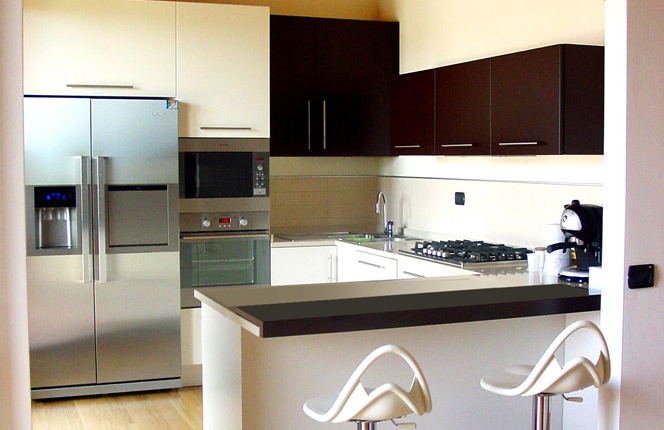 Column wall with ventilated oven, Samsung microwave and refrigerator with ice maker, induction cooker, undermounted sink. Spotted grey okite countertops and backguard. 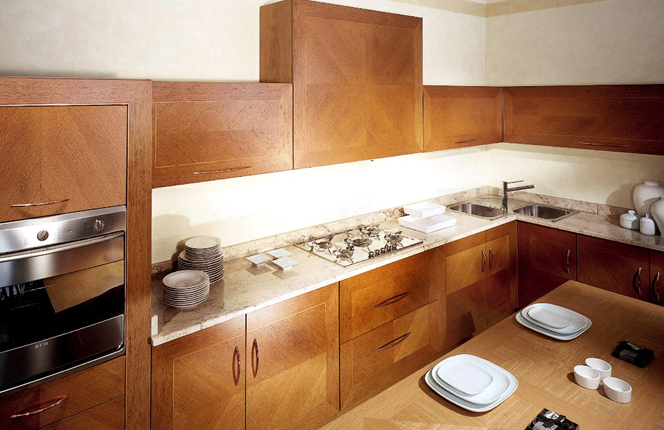 Kitchen with inlaid oak with copper fillet; the symmetrical and mirror-imaged marquetry flows from door to door. Vasistas hanging cabinets, with copper knobs. 5-burner stainless steel cooker with shiny finishing, corner sink, rounded oven. 3 cm shiny New Rosalia marble countertop. Ivory and brown lacquered kitchen, 100 and 60 cm hanging cabinets with vasistas opening. Column with oven and microwave. Samsung refrigerator with ice maker and bar compartment. Lacquered brushed oak kitchen with open-pore and horizontal grain. Column with flush refrigerator and column with internal extractable chest drawers. Stainless steel countertops with splashback. Stainless steel sink and countertops integrated into the top. Open-pore lacquered under-hanging cabinet band with ladle hooks. 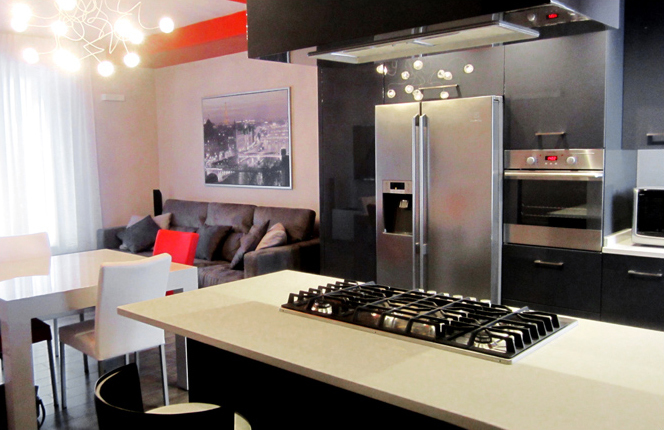 Dark grey shiny lacquered kitchen, column with flush oven and external Samsung refrigerator with ice maker. 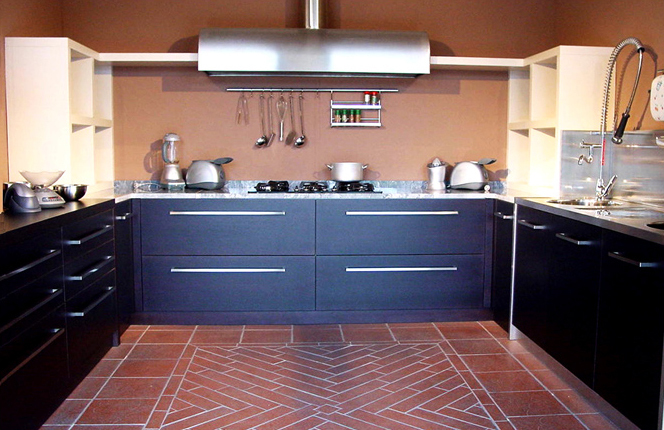 Countertop and peninsula in okite with insertion of a 90 cm cooker with heavy cast iron grille. Shiny lacquered island with hood. Oak kitchen with wengé tinting, horizontal grain. 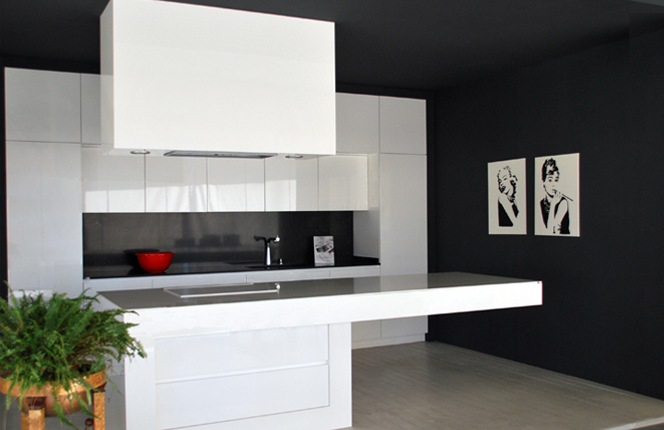 Opaque lacquered shelf and daily elements. Stainless steel sink with integrated washbasins and drip-sill. 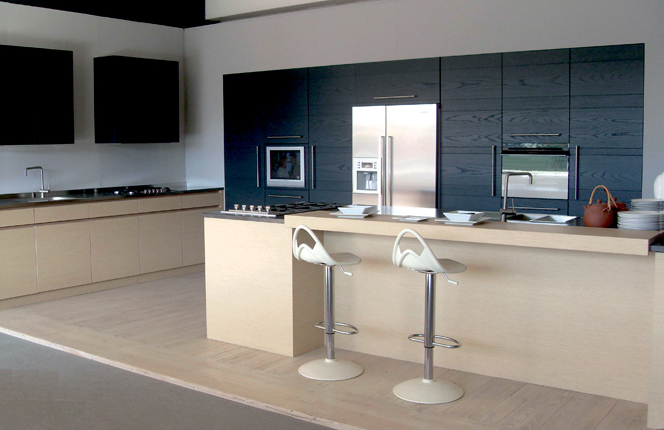 White lacquered brushed oak kitchen with open-pore and horizontal grain. 50 cm high vasistas hanging cabinets and 100 cm high swinging hanging cabinets. Island with drawers and extractable chest drawers. Shiny statuary Carrara marble countertop with undermounted sinks. 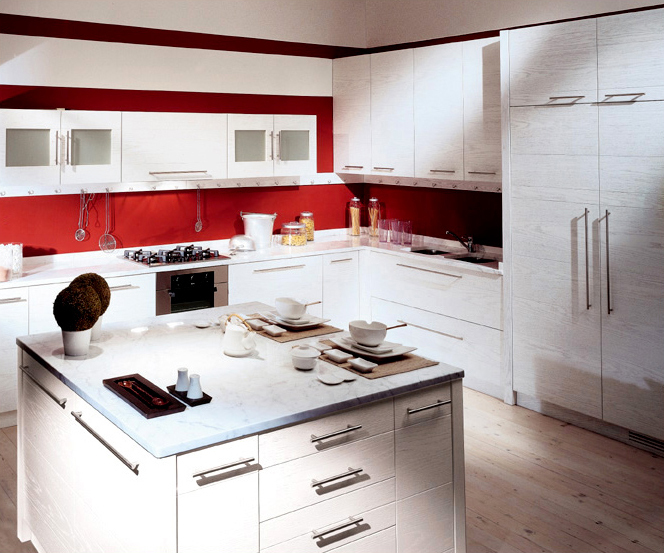 Opaque lacquered kitchen with stainless steel knobs. Column with recessed traditional oven and microwave oven. Two-door stainless steel Samsung refrigerator. Okite countertop and peninsula with backguard. Kitchen in faded oak, column and island with stainless steel covered doors. Vasistas hanging cabinets with acid-treated glass and aluminium profile. Stainless steel countertop and backguard with integrated cooker and sink. Kitchen with shiny white lacquered doors. Wall column with central oven and microwave, flush refrigerator and column pantry. Island with large flush sink and induction cooker. 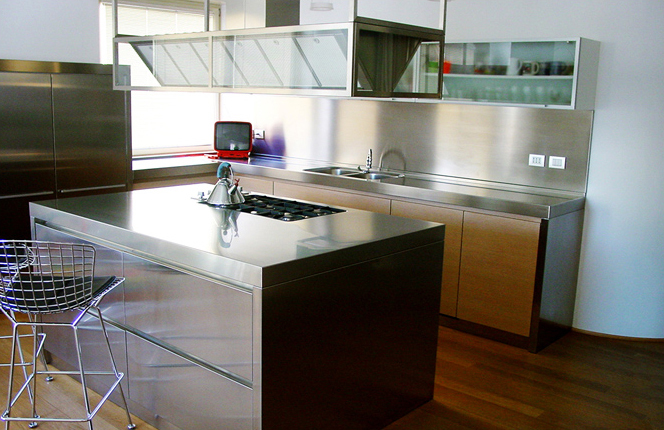 Stainless steel rectangular island hood.. 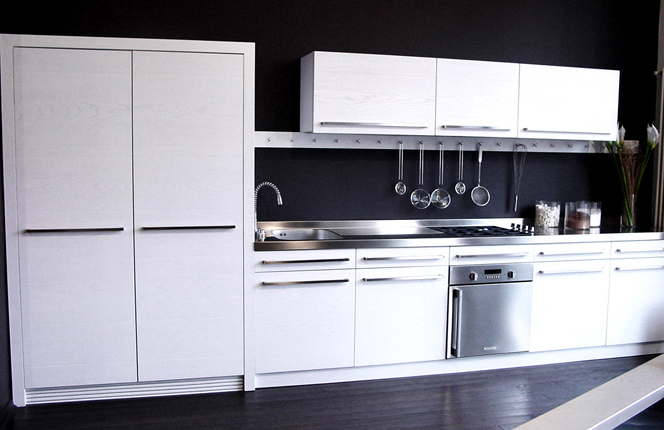 Shiny lacquered kitchen with double professional-grade 35 and 60 cm hanging cabinets. Under-cabinet band with flush spotlights. Column with flush oven, microwave, and refrigerator. Light blue opalescent prism Okite countertop. Undermounted sink and induction cooker. Smooth oak kitchen with horizontal grain. Undermounted double sink in shiny antiqued Botticino marble. Countertop and backguard in shiny antiqued Botticino marble. Two round cookers and two stainless steel round hoods.